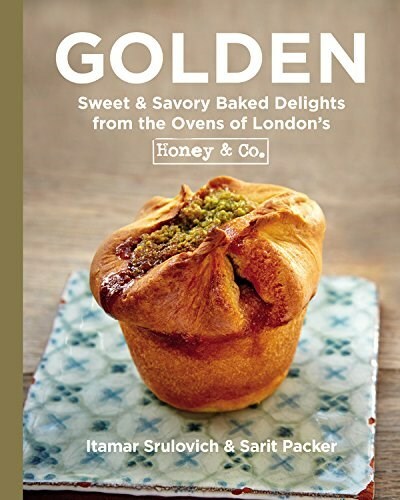 Previously published in the UK as "Honey & Co: The Baking Book" (2015). I only baked 4 buns and the pan was a bit too large, so they spread out a bit, but tasted fantastic. I couldn't find mahleb, so I used cinnamon. I assembled them in advance, froze them, then thawed and proofed overnight on my countertop before baking in the morning. I shaped the buns a few days ahead and froze them, then thawed them on my kitchen counter overnight (my kitchen is fairly cool) and baked them in the morning. Watch the baking time - mine were done after only 16 minutes in the oven. They turned out great - positively scrumptious! This recipe made me decide to buy the book. I didn't make the curd, but filled the doughnuts with blackberry jam instead. I did add lime zest to the sugar, which tasted delicious. The dough is similar to brioche, although not as light. It took longer than 7 minutes to come together in the mixer, but eventually got there (I had to add a bit of extra flour). The buns needed extra time to rise in the morning, and actually didn't fully double, but we got tired of waiting. They did rise more in the oven. I only used about half the amount of butter to brush the baked buns. The sugar did not want to stick to the buns - it's like the butter made them nonstick. I rolled them in the sugar a few times and finally just sprinkled a bunch on top. I wonder if they'd stick better if rolled in the sugar right away, rather than waiting. These "doughnuts" tasted fantastic. A nice, quick, comforting breakfast. I just used lowfat milk - did not need the extra richness from cream. Watch the milk closely, as it can easily boil over (mine did even though I moved it off the heat). The strawberry compote was good, but a bit sweet; I'd reduce the sugar next time. This made a nice, light supper, served with a green salad. The ras el hanout added an interesting flavor. I think you could play around with this recipe a lot (more herbs, other spices, maybe some sauteed bell peppers, etc.). The dough was easy to make with a stand mixer. I made it in the morning, let it rise in the refrigerator for several hours, then at room temperature for a couple, and baked the lahmas in the evening. As the authors state, the trickiest part is getting the unbaked lahma onto the preheated baking sheet. I prepared the lahmas on a sheet of parchment, then used a flat baking sheet to lift the entire parchment sheet onto the preheated baking sheet (which I had removed from the oven). That method worked well. Six lahmas just barely fit on one baking sheet. In my oven, the topped lahmas took 12 minutes to bake at 500 degrees F, possibly because they were a bit crowded. They are sort of like mini pizzas, but the baked dough is softer and less chewy than pizza crust. I used jarred roasted red peppers for convenience, so the topping was super quick to prepare. My harissa was quite spicy, so I used less. The topping was tasty. Also see my preparation notes under lahma dough. I made my own baharat spice mix using Ottolenghi's recipe and it was good here. Maybe I undersalted the lamb, as I thought it could have used more oomph, but this was my son's favorite topping. I was out of pine nuts, so omitted them. I did not need to thin the tahini. Also see my preparation notes under lahma dough. We really enjoyed these. The dough was easy to make, though I found it tricky to shape, and it went well with the savoury topping. I used ground beef and Bon Appetit's baharat spice mix. I tried to make the muffins healthier by using white whole wheat flour and only half the butter, and they turned out fine. They probably won't keep as well as they would with the full amount of butter, but we ate them right away. The flavor was interesting - mildly sweet, but with savory spices. I used white whole wheat flour and olive oil, and made the muffins slightly smaller so I got a couple extra. While the zucchini adds nice color to the muffins, the flavor was mainly from the feta, olives, and spices. A very nice snack or savory breakfast option. I "healthified" the recipe, as I wanted a breakfast loaf and not dessert. My changes: all whole wheat flour, only 200 g sugar, 60 g walnuts, half oil/half applesauce. The loaf turned out great - plenty sweet and not too oily. I would make it again the same way. I reduced the sugar just a bit to 200 g total, and found it plenty sweet. The zucchini measurement seemed off to me - my 2 zucchini, which were not that large, weighed about 250 g. I used all of the zucchini, but perhaps shouldn't have, as I did end up with a slight gummy layer at the bottom. The cake was super moist, to the point of being a bit too oily for my taste. I found the olive oil aroma and flavor to be a bit strong, but my family didn't seem to mind. Overall, we liked this cake, but I'm not sure I'd make it again. But I'd definitely use some of the same unusual flavors, like the star anise and pistachio. Lovely combination of flavours, and light texture. I used about 250 grams zucchini and had no problems. Well worth the time spent shelling the pistachios. Very easy and quick cake to make. And lovely fall flavors: loads of pears and ginger. My only issue was getting the center cooked before the outside browned too much. Perhaps next time I'd bake in a ceramic loaf pan (not a metal one as indicated) and do the 350 oven temp, not the 325 with convection. I also had to add on a good 15 minutes to the suggested cook time. This was fairly easy to make, although I never could get the filling down into the dough. The dough rose around the edges, but did not cover the filling in the center. I put the topping on anyway, and it turned out great. It's sort of like pizza bread without tomato sauce, but the crust is softer, not chewy. Delicious! I subbed in plum jam for both inside the cake and the icing. 1/2 tsp of jam seemed awfully small for the icing, I ended up adding around 2 tsp of jam plus a few tsp of water to thin it out (I also left out the rosewater). I made one large loaf, so I baked it at a lower temperature (350 at first, then turned the oven down a bit after 50 minutes); it took about 80 minutes to bake. The loaf was definitely baked through, but was still super moist when sliced, to the point of being wet. Perhaps the amount of peaches should be reduced for a larger loaf. Still, the taste was very nice - the peach flavor really shone, enhanced by the citrus zest. Surprisingly, the fennel wasn't that noticeable; I'd actually use more next time. I would like to make this again, but perhaps with white whole wheat flour, in hopes of making it drier. I made 1/2 recipe in a 6" cake pan. The batter rises quite a bit during baking (although it later sinks) and nearly overflowed, but thankfully didn't. It took a long time to bake and got quite brown on top, but did not burn. The cake is very wet and dense. Being so heavy, it was tricky to remove from the pan; I had to loosen it around the sides several times, which made it rather unattractive. I piped the frosting because I feared that spreading would tear the cake, which was very crumbly around the edges. The frosting was delicious. The cake was good too, but very sweet, and the lemon and elderflower flavors didn't really stand out. I substituted orange marmalade for lemon, but couldn't taste any orange. These were simple to prepare and turned out fine using white whole wheat flour and orange marmalade. They were moist, tender, and delicious, with a bright citrusy flavor. I used 50% more blueberries and the cake did not get too soggy. I'll definitely make this again. I had a little trouble understanding how to make the espresso, gave up and went to Starbucks in the middle of cooking. The cake was delicious. It didn't have so strong of a coffee flavour that those who are not coffee drinkers wouldn't like. A delicious, moist cake that's a cross between a cheesecake and a nut cake. 50 g hazelnuts were plenty for the top, and actually I would use less next time, and chop them smaller. I would try this recipe with other fruit and nut combinations as well. We enjoyed the cake chilled. I made 1/2 recipe in a 6" round pan. I probably overbaked it, as it did not puff in the center at all, so I left the oven on an extra 5 minutes. Nevertheless, it was still quite moist the next day, although perhaps crumblier than it would have been otherwise. The coffee and cardamom are mere background notes for the strong, dense chocolate. This is a super rich, flourless cake - definitely best with whipped cream to balance the strong chocolate. The recipe was easy to scale down for 2 people, and all the components were quick and easy to prepare. The apricots needed to roast a couple of extra minutes; next time I'd let them roast even longer, until they are softer and start to lose their shape, so that they're easier to eat. The marzipan filling was good, but kind of got lost - you could make this without the filling (slice the apricots in half, top with butter and sugar, and roast). The almond crumble was amazing - loved the sesame and spices. In fact, I'd use a bit more fennel and cardamom (I didn't have mahleb) next time. The brandy cream was a nice complement; I didn't sweeten it, but might next time, since apricots tend to be quite acidic. This would be a good dinner party dessert, as you can bake it earlier, then assemble it at the last minute.